Treat someone to a coffee delight with this personalised coffee caddy in a coffee bean design. The silver coloured caddy contains 227g of darker roasted, Free trade, premium ground, strength 5 coffee, that is also gluten-free and organic. Every day they can start their day with a delicious fresh brew. And when the coffee's all gone the caddy, that is personalised with their name and a message, can be refilled and kept as a memento. A matching personalised mug is available. Treat someone to a coffee delight with this personalised coffee caddy in a traditional design. Treat someone to a coffee delight with this personalised coffee caddy in a leaf design. Our range of Coffee Lovers' mugs are designed for the serious coffee drinker. A nice little set for the coffee lover in your life is this caddy and matching coffee mug in a coffee bean design. A lover of good coffee will adore this hamper containing an exotic packet of their favourite brew plus more goodies. 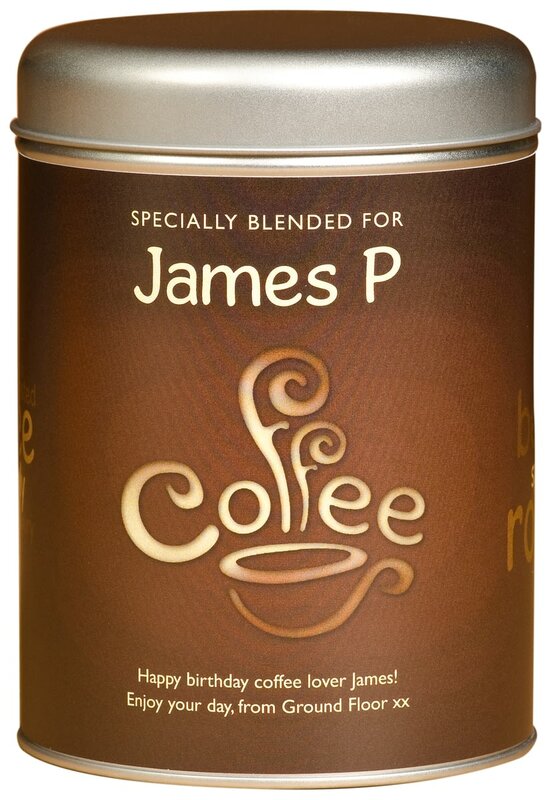 Personalise this colourful Official Jackie coffee tin with your chosen name of up to 22 characters. Inside the tin is a 227g foil sealed bag of delicious ground coffee.